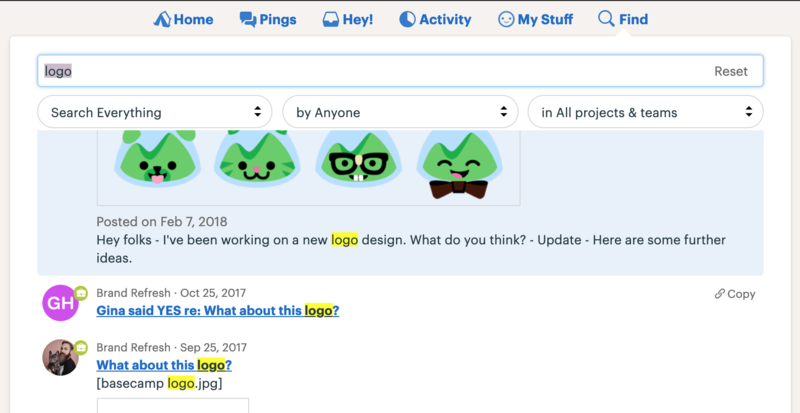 Finding your stuff is easy in Basecamp 3! Just click Find at the top of the page. Just start typing to find anything matching a particular term, phrase, or filename. By default, this will search for matches across all your Projects, Pings, and Files. If you know that you're looking for a file, or that Jane posted it, or even that it's in that Marketing project, you can quickly filter your results down by selecting a filter. Just click the dropdown and select what you're looking for. If you're looking for files uploaded in a particular Ping or Campfire, you can search directly in that conversation. Look for the ••• menu in the upper right corner, and choose the option to "See all files posted here." Sometimes you just need a link to the thing you're looking for. When that's the case, just locate the right result, hover over it and click the copy button that appears in the top-right corner. Once the link has been copied, you'll get success message letting you know it worked. Note: Not all browsers support the "Copy link" feature. If you're not seeing the Copy button, it means your browser doesn't support that capability.